This is a story about four kayakers who just wanted to spend a day out there on the ocean, alone, and away from the big city, all its people and the over curious and over zealous kayak observers. But even out there they discovered that the ocean is no longer the place to get away from it all. After a quiet, lonesome and enjoyable paddle from Wattamolla to South Erie beach, the return journey was marred by over curious and over zealous kayak observers. Yes, two whales – they just couldn’t leave the poor kayakers alone… what is the ocean coming to! From at least 400 metres the whales spotted them, the kayakers thought they were safe and hadn’t been spotted because the whales were north east of them and heading north. Three of the kayakers stopped, hoping to allow the whales to get more distance between them thus avoiding being spotted. The fourth had cunningly stayed closer to shore, about 400 metres away from the other, and thus was less obvious. But no! The wonderful solitude would last no longer. No sooner had the three kayakers stopped and the whales just had to zoom in and disturb them. They turned and headed southwest, straight toward the kayakers. Within minutes the whales had breached the 100 metre kayak exclusion viewing zone and were swimming around and under the three kayakers. The kayakers protested of course but the whales persisted, coming within 5 metres of the kayaks at times (the National Parks & Wild Life Service would be receiving an official complaint). These huge whales, believed to be humpback whales, just would not leave the poor kayakers alone. Of course the fourth kayaker was signalled by the other three to stay near the shore and avoid the intrusive spectators. Sadly the fourth kayaker mistakenly read the signals of waving paddles and decided to rejoin her friends. By the time she was 200 metres from the other kayakers it was too late. One of the whales had spotted her and, as whales do, one of them, the biggest one, just had to swim over and disturb her. None of the kayakers escaped the intrusion. There was a sudden burst of paddling as the lone paddler accelerated to join her friends (protests in numbers are usually more successful). The four kayakers were then subjected to at least 30 more minutes of whales watching. In front of them, behind them, either side of them and underneath them (but thank God not above them). Each of the four were examined. It was just so impolite; it felt like we were some kind of a freak show. All this time, south of the area, a storm was brewing and gradually approaching the kayakers. Eventually the storm was spotted and the kayakers decided to make a run for it. Even then the whales wouldn’t leave them alone, and swam between them for a while whilst the kayakers tried to escape the whales and beat the storm. Eventually, thank God, the whales got bored and lost interest, leaving the kayakers to themselves again, but the storm was still approaching. With kilometres still to paddle and no landing spot until the end, the kayakers paddled north into a head wind, but the storm was also heading north, and soon the sound of thunder could be heard, with lightening flashes observed out the corner of their eyes. The paddle pace increased, but still the storm got closer. Then the headwind stopped allowing the speed of the kayakers to increase, but it was a short reprieve. Soon the wind was a tail wind and white caps were approaching. Faster, faster, was the common thought of the kayakers. On the shore up on the cliffs people could be seen looking down at the stricken kayakers and behind them at the rapidly approaching storm clouds. More lightning, more thunder. Suddenly the sea got choppy, confused by the sudden change of wind and the rebound off the nearby cliffs. Faster, faster, they thought. Then without warning, and with at least two kilometres still to paddle, the storm moved further out to sea and away from the kayakers (maybe there is a Kayakers God). With the sea conditions still worsening and fearing that the storm might turn back onto them, the pace was maintained, but the kayakers were more relaxed now, and soon they were all safely back on land. Several people were on the beach and so it was important not to say anything about the whales, the last thing these solitude seeking sea kayakers wanted was to be mobbed by more over curious and over zealous kayak observers. The truth is, the kayakers had a great day and as for the whales, well, I’ll leave it up to you to imagine how we really felt. Sharon, Robert, Dennis and Tony left Wattamolla beach at around 11:00 am and paddled south to South Erie Beach. After a lunch break they went a little further south to Burning Palms then headed back. The whales were spotted on the way back just north of Gerrie Beach about 1 km offshore. And yes, we never approached the whales, they were heading north when first spotted, then they turned and come over to see us. This is one experience I’ll never forget. The wind was howling, the sea a mass of white caps, gusts were hurling me across the water and every second stroke seemed to be a support stroke as waves broke over the back of my kayak. I didn’t need a sail, my unfeathered paddle was enough. At other times I found myself thrust forward with great speed as I went sliding down the face of the following sea. The gale was well upon us now, blowing us ever closer to the famous Wineglass Bay. This was the worst weather we had paddled in during a trip that had begun several weeks before. We were all experienced kayakers with a lot of surf experience, and although the seas were intimidating there was the pleasure and satisfaction that comes when the boat and you are working efficiently together. Dirk, looking ahead through the wind driven water, saw a beach tucked well inside a bay and signalled us to make for shore. Eager to get to Wineglass Bay and unaware how quickly the gale had pushed us along, I was sure we could not be there yet. However, the wind had moved us at nearly twice our normal paddling speed, confusing me slightly. With the wind behind it wasn’t long before we reached our destination and were sitting on the beach looking back at the galloping white caps. Wineglass Bay was about halfway through the 650 kilometre trip that started three weeks previously when Mike Snoad, Dirk Stuber and myself set off to paddle from Devonport to Hobart by the north, then east, coast of Tasmania. The idea for this trip came after I’d read an account of an old sea kayaking journey by the Reverend Fred Fairey. In 1879 he said goodbye to his wife and child on the banks of the Forth River and set off in his wooden ‘Rob Roy’ canoe to paddle to Hobart, visiting his parishioners along the way. It seemed to be a trip worth following and after several months of planning the three of us set off from Canberra, picking up the ferry at Melbourne. A leisurely cruise across Bass Strait saw us at Devonport the next morning, near Reverend Fairey’s starting point. Somehow we fit the mountain of equipment into our kayaks before hauling them into sea and turning east. The wind was strong at 25 knots on the first day with a one metre swell, but thankfully it was behind us. My expedition-laden kayak felt slow and sluggish as we set off, loaded as it was with several weeks’ worth of food, extra water and all my photographic equipment. We stopped for lunch on a small rocky outcrop called Wright Island, as this was where the Reverend spent his first night. The two of us with fibreglass boats heard that awful scratching sound of grating keels as we tried to maneuver our heavy boats onto the rocky shore. Pushing on in the following seas with my well-laden kayak I began to notice some discomfort in my forearm. By the time we landed at our first campsite I had all the painful symptoms of crepitus tendonitis. Aware of the implications of this type of injury and knowing I would have to continue doing the very thing that caused it, instilled in me a disappointment that I may be forced out of the trip on the first day. We were carrying a comprehensive first aid kit, so I swallowed some anti-inflammatories and decided I would re-assess the situation in Bridport; which was three days’ paddling away. The second day the wind had died down and we followed a mostly deserted shoreline of undulating hills, rolling sand dunes and clear blue water. In the gentle sea conditions with no swell we enjoyed the paddling, ducking into little bays or landing on sandy beaches. The shallowness of the water was new to us, and even up to a kilometre offshore we could still see the bottom. Several cottages, probably holiday shacks, were interspersed along the coastline but there seemed to be no-one around. Large standing waves at the mouth of the Tamar River, fishermen trawling too close and a long slog through a southeast headwind brought Bridport into view on the fourth day. After setting up our tents on a grassy beachside camping ground, our thoughts went to food. Four days of camp cooking sent us searching for the pub for a decent meal. ‘Ask a local’ is a good adage to paddle by. The pub was quiet and friendly and because it was somewhat off the beaten track we were quite a novelty. Dougie, the local cray-fisherman, had many yarns to spin, providing a wealth of information about the area. Fisherman are a great source of local knowledge and although they think you are slightly mad going to sea in such small craft, they are always helpful in giving advice about weather, tides and possible campsites. As I had suspected, four days of paddling had not helped my tendonitis. The local doctor had little sympathy and gave me a stronger dose of anti-inflammatories. But I knew more substantial action was needed to alleviate the pressure on my arm if I didn’t want to jeopardise my part in the trip. I felt my only option was to put a rudder on my kayak to limit the number of steering strokes needed. Not having owned a kayak with a rudder fitted and aware of the constant debate they cause, I was interested to see what difference it would make. Fitting a rudder after starting an expedition would not be easy but here luck was on my side. Jeff Jennings, one of Tasmania’s formidable sea kayakers, lived in Bridport and he very kindly offered to help. Our visit was rather fortuitous for me as Jeff was driving out to Little Musselroe, one of our planned stops, in a few days to pick up some Victorian paddlers who were crossing Bass Strait. As Little Musselroe is only two days paddling away I stayed back to help fit the rudder, planning on meeting Mike and Dirk there. Dirk and Mike headed off at four in the morning to miss the expected strong sea breeze as they had a long open crossing from Bridport to Croppies Point. As it turned out the breeze never came but the heat did so the early start proved useful. Jeff and I drove into Little Mussleroe a few days later just as Mike and Dirk were pulling their kayaks ashore. An hour later the Victorian paddlers arrived, tired but elated after the rigors of a Bass Strait crossing. For those unfamiliar with this area, Bass Strait is the main stretch of water separating Tasmania from mainland Australia and has a reputation for dishing up some of the worst seas in Australia. Last year in the Sydney to Hobart yacht race it claimed six lives. It is also a Mecca for experienced kayakers looking for a challenging trip. For although on a map it looks like it is too large a crossing to attempt, there are some very well placed islands, allowing one to island hop all the way. With my arm feeling better, I was ready to get back on the water and looking forward to visiting Swan Island. However, it wasn’t to be and a severe bout of food poisoning left me incapacitated for several days. Thinking the illness had passed, I joined the others for a paddle out to Swan Island, only to be hit again just after we landed. We set up camp in a small cove on the southern shore and while I recovered in the tent, the others explored the island. One of the interesting aspects of Swan Island, apart from its lighthouse, is its numerous venomous Tiger snakes. We found this out after wandering around the island in our usual footwear of either sandals or bare feet. This wasn’t mentioned in the Reverend Fairey’s log but he did mention the hospitality. I was now faced with a dilemma, for it had been three days since I had eaten and I felt weak and dispirited. I was forced to accept that I was not yet fit enough to manage the long paddling days ahead. Therefore, for the second time I decided to pull out and try to catch up with the others in a few days down the coast. After two days of travelling through the Tasmanian countryside on the back of several delivery trucks I caught up with them at Binalong Bay near Saint Helens, about fifty kilometres down the coast. To get off Swan Island I hitched a ride with Dougie, who was out to set his cray pots, one of which he attached to my kayak to act as an anchor, while we steamed around in a choppy sea setting the rest. Jeff met me at Musselroe and gave me a lift back to Bridport. My spirits were sinking, here it was the tenth day and I was, in paddling terms, only four days from the start. I could see my part in the trip disappearing like a piece of flotsam on the ebb tide. As I began to feel better I felt more positive and determined not to miss out on the rest of the trip. I arranged for a truck to take me to Launceston and another from there to St Helens, where I finally met up with my companions. Jeff also had warned us about this section of coast. Its steep beaches produce nasty shore dumpers making it difficult to land. This was the only place that the Reverend came out of his boat and we followed the coast looking for a suitable place to come ashore. Although we were all very experienced in coming through surf, landing a heavy expedition boat in a large shore dumper has the potential for breakages. Arriving at Beaumaris, several kilometres north of Falmouth, we sat outside the surf line studying it for a while and decided it wasn’t too bad. I stowed my hat and sunglasses, picked a reasonable sized wave, and headed for the beach. As the wave broke and I started to broach I threw my whole body into the face of the wave, going underwater for the first few seconds, though it seemed like minutes, and with a solid high brace managed to execute a beautiful beach landing. This was to be a short stop as we needed water and Dirk and I wanted to ring home as we both had teenagers who were celebrating their birthdays. Both chores completed we set off back through the surf but this time the force of one wave breaking over my kayak was so strong that it ripped the spare paddles off. We landed again and managed to retrieve one half, but extensive searching didn’t reveal the missing section, so we set up our tents in the sun dunes, hoping the tide would bring it back. The loss of our only spare paddle caused some tension within the group with an air of disharmony creeping in. It didn’t last long and we took advantage of the local pub, which coincidentally was just over the road. During the night the wind and rain came, turning a tricky surf exit into a completely unsafe one. It was the following morning before we were able to leave and we still needed to get through several sets of breakers. Dirk went first, getting past the shore dumpers, then catching his breath while he waited for a lull in the next set of breakers. Mike and I watched as Dirk powered through wave after wave gaining only a small distance each time. Seven times he was hit by a wall of white water before he was able to push past the last wave out into the open water and recover. Dirk was the strongest paddler in our group and Mike and I looked at each apprehensively. With my arm still strapped, Mike offered to go last and gave me a shove off. As soon as I started I dug my paddle in for all it was worth, hitting the first wave as the top started to break then the kayak made a thunderous crash as the front came down the other side. With the adrenaline pumping I kept going as fast as I could and to my amazement found I was past the surf zone before the next wave broke. “You had an easy run,” was Dirk’s comment. We turned to watch Mike and several times he disappeared behind a wall of water. After one thumping wave had passed we saw Mike’s kayak upside down. He no sooner rolled back up than another wave was on top of him. An exhausted wet Mike eventually pulled up alongside, telling how he had to roll under three waves to get out. Once past the surf the sea was smooth and calm with a large slow rolling swell. It was going to be a long day as we needed to make up for lost time and it was 55 kilometres to our next planned stop at Bicheno. Vivid red rocks glistened in the morning light as the sea spray hit the brightly coloured lichen. We followed a coastline of rolling hills, semi-green pastures with the mountains of St Marys Pass providing a scenic backdrop. The large swell, which was no problem off shore, stopped us landing and it was mid afternoon before we were able to find a sheltered cove, eventually pulling in at Long Nose Point to stretch our legs. It was here that we deviated from the Reverend Fairey’s trip; he’d hitched a ride on a horse and dray, bypassing the outside of Freycinet Peninsula altogether. We paddled the remaining 13 kilometres over to Bicheno, taking a day off to wash our clothes and stock up on food. The predicted weather for our day of departure caused us some concern, with strong wind warnings forecast. As the wind was going to be behind us, we decided to head off anyway, though in retrospect we should have waited another day. By lunchtime we were running before a gale. It was during this day that nature showed us not only its ferocity but also its beauty. While we were paddling I noticed on the far eastern horizon a flock of birds, possibly shearwaters, that had no start, no end, stretching as far as I could see. There seemed a certain poignancy, we rode the sea in our small craft, the shearwaters rode the wind, in their even smaller bodies. A juxtaposition of journeys, ours to enhance our lives but theirs the very essence of life itself. I felt privileged to be witnessing a phenomenon that has probably been happening for tens of thousands of years. It was this wind that finally brought us safely into Wineglass Bay. Once past the headland the anxiety and vulnerability slowly dissipated and I started to relax as I paddled the few remaining kilometres to the beach. A lack of concentration saw Mike and I upended in the surf. My head hit the sand of the shallow bottom and thoughts of a broken neck quickly sprang to mind; without even attempting any sort of recovery I quickly slid out of the kayak, pulling it up the beach. I was relieved to be on dry land and took in the breathtaking beauty of the bay as the white sands and deep blue water curved around in a long arc. It is easy to see why so many tourists take the short but steep walk over from the car park. Leaving Wineglass Bay we followed a coastline of towering granite cliffs and more red lichen-covered rocks. Our campsite for the night was a small but sheltered cove on the south of Schouten Island at the end of Freycinet, with the strange name of Hen and Chicken Bay. This gave us an easier run the next day, as we had a forty kilometre open crossing to Maria Island, the only break being a small granite outcrop known as Ile de Phoque, reported to be home to a large seal colony. That night we ate well as a fisherman, whom we had asked for the weather forecast, gave us a crayfish. Dirk managed to find an abalone and I caught a couple of fish on my trawling line. We set off early from Schouten, eventually paddling into some large sea caves on the eastern side of Ile de Phoque which provided some welcome protection from the sun. “Where are the seals?” asked Mike and Dirk, as it was my idea to visit this small rocky outcrop just to see them. After a bite to eat we rounded the northern end of Ile de Phoques, to find the seals sprawled out on the rocks like tourists at a popular holiday resort. Our presence caused a chorus of barking followed by a stampede as they came hurtling down the rocks, crashing into the water. The calm sea became a mass of white water as seals were diving and frolicking all around with green bubbly trails in the water below as they glided effortlessly under our kayaks. It was then I remembered that seal colonies often have a resident white pointer shark and I wondered what my kayak looked like from underneath. Late in the afternoon the sea breeze picked up just enough for us to hoist our sails for an easy run into Darlington Bay on the western side of Maria Island. As in most places we stopped, people were interested in our journey. One of the local rangers, when we told him about visiting the seal colony, confirmed my suspicions, mentioning that a white pointer took a diver there last year. Hmmm. Maria Island has an interesting history. It was first circumnavigated by French explorer Nicholas Baudin in 1802 and he commented on the large number of Cape Barren geese there; there still is. It later became a convict settlement, then a whaling station, a centre for wine and silk, followed by a cement works which ended with the Great Depression. It finally became a nature reserve in 1960 and is now managed by the National Parks and Wildlife attracting thousands of visitors each year. There are several interesting ruins left from its diverse history and one can stay in renovated rooms that used to be convict cells. Numerous walks are on offer with some that can take several days and the Island is a popular destination for backpackers. One of the more prominent features on the Island is Mount Maria, the summit of which offers wide ranging views back to the Tasmanian mainland and beyond. It is generally a good six hour return hike but we, now being ‘creatures of the sea’, took the easier hike up to the top of nearby Bishop and Clerk. It offers views back to Schouten Island, Ile de Phoque and the expanse of Darlington Bay and is only 3 hours return. I enjoyed the three days we stayed on the Island and it’s definitely worth a return trip. An ocean of milky whiteness enveloped us as we left Maria in the morning fog but it cleared by the time we hit the mainland. We slipped into a small sheltered cove named Lagoon Bay which the Reverend labeled “a most romantic spot” – he must have been missing his wife. Not long after tea the horizon took on a tender touch with purple and mauve hues pushing aside the ashen grey twilight and bathing the area in soft pastel colours. I knew what this meant and, grabbing my camera and tripod, bolted to the top of the nearest hill. I had just managed to set up when the pastel colours shifted to fiery reds and gold, taking over the whole sky and lighting it up like some sort of apocalyptic Armageddon. I had to slow myself down before I used up my entire supply of film. It was here that we deviated from the Reverend Fairey’s journey again. To avoid the long and potentially dangerous Tasman Peninsula, he paddled into Blackmans Bay and with the help of the locals carried his canoe over the small spit to Norfolk Bay. The wind was against us the next day and although we did only twenty kilometres it felt like fifty. It became one of those grin-and-bear-it paddles where you often don’t appear to be going anywhere as you pound into the never ending waves. It is in these conditions that you enter your own world. You can’t talk to your paddling companions, you can’t stop, so you just plod on, locking yourself into a smooth paddling rhythm that allows you to go forward without using too much energy. The following day the sea was perfectly calm. It seems to be a characteristic of Tasmanian weather; awful one day, perfect the next; neither good nor bad weather lasts very long. Not far from Eagle Hawk is a popular tourist site known as The Blow Hole. Here the sea comes through a long narrow tunnel, finishing in a small alcove. When the waves come in they produce a mountain of spray. The calm sea enabled us to paddle down this tunnel arriving in the alcove to the utter amazement of the tourists lined up along the fence above. There are sea caves and arches all along this part of the coast and the calm seas made exploring them easy. We checked for abalone by flipping upside down, then eskimo rolling back up. For those of you who haven’t learnt this skill, it has some wonderful benefits apart from self-rescuing. It is a superb way to check out the scenery below without getting out of your boat. A whole new world opens up to you, dark blue depths, graceful seals and giant strands of kelp reaching up to the surface like a hidden forest. The abalone are difficult to spot with their pink spotted shells blending in with lichen-covered rocks. Even the kelp hides them as the long strands dance back and forth across the bottom swaying with the never ending flow of the sea. As you are just hanging there not using any energy you have a suprisingly long time in which to look around and it only takes a few seconds to roll back up. I always carry a pair of goggles handy for just this reason. As we paddled along admiring the soaring cliffs, we could make out the Lanterns past the entrance to Fortesque Bay. The Lanterns are a series of islands, spread over a kilometre at the end of Cape Hauy. However, the real draw card is two rock formations known as the Candlestick and the Totem Pole. The Totem Pole is a Mecca for rock climbers the world over attracted by this 65 metre column of rock sitting in the middle of a narrow channel. Just getting to the base is a challenge. The sea was still calm and the sky a brilliant blue as we approached the entrance to Fortesque Bay, where we planned on waiting for good weather before attempting the long and exposed leg around Cape Pillar. I thought about paddling the few extra kilometres to photograph the Lanterns in such perfect conditions but, feeling lazy, decided against it and paddled over to the camping ground. Predictably the weather changed the next day with gale warnings all down the coast. It was like this for two days before we were able to paddle and although it was calm on the third day, it was overcast and dull, ruining any chance of good shots of the Lanterns. I made Mike and Dirk wait a little longer in the morning light but it didn’t change much. When we got there even in the dull light, the sheer size of the Candlestick gave off an aura of power as it rose straight up out of the sea. A moderate swell gave us an easy run through the gauntlet into Munro Bight where we continued on to Cape Pillar. Tasman Island greets you as you round Cape Pillar. This small island rises straight up for 250 metres with the ruins of an old landing gantry at the base. It was here, before the advent of helicopters, that ships used to bring supplies in for the lighthouse keepers on top of the island. The Tasmanian kayakers often land here by riding the swell onto a kelp-covered rock shelf, hanging on to a piece of kelp while the swell subsides, then quickly getting out before the next set. Shooing the seals out of the way they then haul their kayaks up to the next ledge (otherwise the seals will sit on them), before undertaking the long trek up a steep narrow track to the top. We thought we would give this a miss, though they tell me the views are worth it. Heading through Tasman Passage following the cliffs, we eventually landed inside Port Arthur at a sheltered sandy beach called Safety Cove. As it was only lunchtime and a beautiful sunny day, we decided to go and visit the old convict ruins. This is one of the most significant historical sites in Tasmania and well worth a visit. Paddling into the cove with the afternoon sun highlighting the sandstone ruins, we were awarded a scenic view from the water. Providing we didn’t land we saved ourselves the $16 entrance fee. Heading back to Safety Cove, we experienced yet again the wonderful hospitality of the Tasmanians. While looking for a public telephone, a friendly local invited us up to his place, treating us to coffee and homemade cake. Then, as if this wasn’t enough, he insisted we take some fresh vegetables and some fish he had caught back to our campsite. This was only matched by another local, who on seeing our tents, invited us up to try his home brew. Several jugs later we staggered back to our tents, remarking on what a great day it had been. We had arranged to meet the Tasmanian Sea Canoeing Club at White Beach for their AGM but found most of them on a rocky outcrop, Wedge Island, about four kilometres from there. We caught up with Tasmania paddler Mike Emery who had picked up our car in Devonport and driven it to Hobart, saving us a very long car shuffle. Mike had given us invaluable advice about the coastline and invited us to join his fellow paddlers for a BBQ. It was a mixture of relief and accomplishment when, two days later, we sailed into Constitution Dock in Hobart. Mike and his partner Veronica kindly put us up for a few days before the ferry crossing and long drive back to Canberra. There is a lot that must have changed since the Reverend Fred Fairey made his trip in 1879 but one thing that hasn’t is the hospitality of the Tasmanians. Reverend Fairey comments at the end of his log on his “hearty reception and unbounded hospitality”. We also, throughout this trip, had the same experience – a special thanks to Mike Emery, Jeff Jennings and the Tasmanian Sea Canoeing Club. But I couldn’t sleep. It was a hot, humid night, the air heavy with moisture. I lay awake wondering what tomorrow’s weather would bring. Weeks of planning and organising had gone into this trip. Trip briefings, phone calls and meetings. Discussions on weather, tides, reefs, destination syndrome, pull out points, distances, campsites, decision making processes, group spread and group cohesion. Finalising leave from work. Organising back-up and support and float plans. Last minute purchases and packing. Finishing touches, including a sail, being added to my new plywood boat. What began as a vague idea tossed about six months ago was about to become a reality. Our original group of three Gonads and three Woodies had now dwindled to two Woodies, one Gonad and one with Gonad envy. After an anxious night, Saturday dawned drizzly and windy. A 5 am call to the Bureau indicated south easterlies at 10-15 knots. Andrew offered to accompany us to Little Marley, drive our car home, act as our support crew if needed, keep up to date with our progress, and drive our car and any extra gear to Currarong the following week. So, our early morning start saw Andrew Eddy, Rob Mercer, Dennis Kleinberg, Tony Neiderberger and myself, plus a mountain of gear, at Bundeena. Some fascinated onlookers warned us of the headwinds we would face all day. Their daughter’s candid question, “why are you going out there in those small boats?” left me with something to mull over while I packed my craft. Once out in the bay the Woodies hoisted their sails not knowing that their sails would lie dormant on their decks for four days! We lunched at Little Marley (Dennis had a tin of satay tuna and corn cakes) and decided to push on. Andrew had accompanied us thus far and he was looking forward to sailing back. The predicted southerly looked likely to continue at least for today. As we paddled south the sandstone cliffs gave way to heavily vegetated buttressed ridges that met the sea. Pockets of settlement dotted the beaches – a remnant of a former era when people leased land from the NPWS. Off Stanwell Park our lack of sleep caught up with us and lethargy set in. It was hard to paddle and we rafted up for a drink and a snack. A look at my GPS indicated that our forward paddling speed had decreased. Options were discussed and we decided to continue – the lure of hot showers and a legal camping site at Coledale Beach a definite plus. The line of Norfolk Island pines along Coledale’s shore were a welcome sight, especially as the drizzle had turned to rain and mist was beginning to fill the valleys. After negotiating a surf landing and a short portage with heavily laden boats to our campsite, I phoned my brother and sister-in-law (who live nearby) and arranged to meet up with them for pizza and liquid refreshments, while Rob made the first of many phone calls to Andrew to keep him up to date on our progress. Even the constant rain and the proximity to the rail line didn’t keep us awake. Soon after dawn we launched through the surf and it didn’t matter that my gear was a bit wet when I put it on because now it was wringing wet! Sitting outside the breakers it was still and soupy. The fog would certainly add some atmosphere, and if the predicted north easterly got up we’d have an easier day. However, the sea fog prevented us from admiring the coastal scenery. We took a compass bearing to ensure our correct course and I kept a watchful eye on the waypoints in my GPS. We were accompanied by a variety of marine and bird life, the drizzle continued and the wind picked up – a 15 knot southeasterly. While lunching at Wollongong Harbour (Dennis had a tin of tuna with basil and lemon grass, and corn biscuits), Rob received a weather update (still predicting NE winds) and information on conditions around Port Kembla. He asked about boat traffic in and out of the Port and possible passages through the Five Islands from the local Coast Guard HQ which was open and conveniently located on the water’s edge. We launched with new enthusiasm knowing that there were no craft registered to leave or enter Port Kembla that day. The wind picked up and the rain eased as we paddled along the breakwater, our view of the islands and any associated reefs obscured by fog, the rocky wall seemingly endless especially with few visible prominent landmarks to line up and assess our progress. Rafting up near Red Point we watched for a possible passage between the reefs and Big Island and scooted through close to shore, narrowly avoiding tangling ourselves in fishing lines. I couldn’t imagine how Stuart Truman managed to camp at Red Point on his trip south two years previous. The grade 1 surf landing was okay, but the grade 5 stench emanating from the sewage works was a definite put-off! To the south Windang Island stood proud, protecting the entrance to Lake Illawarra. The south flowing current was quite strong and opposed the 20 knot southerly. This and a beam on swell made for a confused sea state. We paddled close, but still managed to lose sight of each other in the troughs. Every now and then the fog lifted and each time Windang Island appeared to be getting no closer. Rob stopped to take a bearing, lining up a tree and an aerial. He paddled on and each time the fog lifted, looked at what he thought was the same bearing line only to find out later that the area behind the beach was dotted with several similar trees and aerials! From Barrack Point, Shellharbour came into view and Dennis and Tony paddled with a new resolve. I had to paddle harder to try and keep up, the swells on my beam washing over my spray skirt and my drinking tube trailing in the water. I think we were all relieved to land on ‘terra firma’. I organised a site at the local caravan park and the owners insisted on giving me a key to the boom gate. They couldn’t understand we had come by sea without any car back-up. To placate them I took the key (and returned it the next morning). Later that night Dennis provided entertainment in the form of a ‘show and tell’ evening. He had brought the contents of his kitchen ‘junk’ drawer in a screw top container, calling it his ‘survival kit’. He then proceeded to give us a detailed description on the usefulness of each item – elastic, string, panadol, matches, knife… the list went on. We left Shellharbour late, after Nick Gill give us a detailed description of the synoptic chart over the phone so we could get a more accurate idea of long-term weather possibilities. Of course headwinds were predicted for the next two days so we decided on a shorter distance and set off for Kiama. For Rob and I this was another familiar section of coast. A few weeks previous he and I and Andrew had sailed our kayaks north from Kiama. Today we would be paddling hard and wide to avoid the reef break that we had surfed off Bass Point in more agreeable weather only two weeks ago. It was good to stretch our legs at Kiama and walk to the Blowhole. Rob told us how he’d heard about how one prominent Club member had frightened a group of tourists by paddling through the base of the Blowhole. I could only think of the great photo opportunity I had missed! The caravan park at Kiama looked wet and exposed so we decided to continued on to Easts Beach a few kilometres south. For Dennis lunch consisted of tandoori tuna and corn cakes. But, before heading off Dennis had some business deals to negotiate. Apparently, unlike the rest of us, he hadn’t officially taken leave from work. So, each lunchtime Dennis could be seen reclining on a grassy slope, mobile in one hand and tuna sandwich in the other. Likewise, in the evening a few more calls were made in much the same manner. We envied him for his relaxed approach to work. Once around Kiama’s headland we could see another smaller blowhole spraying water several metres into the air, and knew that the bay beyond was our destination. Easts Beach is a long embayment, and as such is a protected landing providing you can negotiate the rebound. The swell hits the northern headland and then ricochets off the southern headland, much like a pinball machine with your kayak as the ball! Portages were becoming a monotonous twice-a-day ritual. Carrying the boats full of gear over long distances wasn’t feasible. So each afternoon we followed the same format: emptying boats, carrying them, and then carrying the gear – reversing the process in the mornings. However, today Rob’s boat had taken on water through an improperly fitted hatch-lid and the water had to be pumped out before it was carried ashore. My boat’s hatches leaked and I found another use for silver duct tape and, from then on, carefully sealed my hatches each morning. Gear was then rinsed and hung to dry over every available fence. For once we were thankful of the strong winds which, during the evening, Dennis measured on his wind metre as 18 knots with gusts to 24 knots! And it rained and blew all night! So we declared that a rest day was in order. Getting ready to walk into town to see the sights, stock up on supplies and have lunch, Rob and Dennis realised their jeans were a tad too large. Their now trim waistlines (created by several grueling days paddle) wouldn’t hold up their jeans. After dipping into Dennis’ survival kit they created the ultimate fashion accessory for the new century – the bungee and pink olive cleat belt! To break from his usual tuna fish lunch Dennis had a pie and a quiche. After a big barbeque feast we slept well, woke up before the alarm, and were on the water by 7 am, hoping the bureau’s prediction for a northerly wasn’t another lie. We were close, but we weren’t complacent as we still had over 40 kilometres to go to reach Currarong. Dennis and I bemoaned the fact that we had a few blisters forming but came up with another idea for silver duct tape – using it to bind the spots on our hands where blisters were forming, keeping a few strips on the deck for any pressure points that might manifest themselves whilst paddling. South of Kiama the scenery is truly delightful. It is lush dairy country where grasslands tumble down to the sea. Cows graze on the slopes and small villages are tucked in behind pocket beaches with foreboding surf. Before long we’d rounded Black Isle and a gentle southerly sprung up. Coolangatta Mountain could be seen in the distance. Rob saw a shark and I had a dolphin and later two seals swim with me, blissfully ignorant of the Bairdarka’s hunting origins. We pulled in at Tilbury Cove (Culburra) for lunch. Dennis had tuna with sundried tomatoes and corn cakes and I had a well earned snooze before setting off. Launching with a northeasterly lifted our spirits. Before long the Woodies sails were hoisted and the strengthening wind pushed them the last 12 kilometres into Currarong. Margot met us and we had a celebratory dinner at the local bowling club before retiring. Dennis’ Gonad envy had now finally surfaced. There were no GoreTex socks for this lad. He had two tennis balls stuffed inside a nylon stocking, supposedly prescribed by his physiotherapist and used for ‘medicinal purposes’ to ease the aches and pains in his shoulder and neck. But it did leave us wondering, especially when, later that evening, we heard strange noises emanating from his tent that he attributed to blowing up his air mattress! Margot wondered if his evening’s partner felt ‘let down’ in the morning. Currarong camping grounds were quiet with only our four tents. We woke to favourable weather for the last leg into Jervis Bay. By the time we paddled around the turbulence at Beecroft Head, the northerly was strong and my GPS indicated I was travelling at just under 9 kilometres per hour, enjoying the push of the current and wind. The cliffs looked striking in the morning sun and I stopped to admire them. Dennis, unaware that Rob, Tony and I had slowed down to talk, suddenly found himself surfing uncontrollably down the face of a wave, narrowly missing Tony in his bright red helmet. As we rounded Point Perpendicular the cliffs gave us some reprieve from the following sea and we were able to paddle in close to explore the myriad of bays and caves before landing on Target Beach for lunch (Dennis had tuna in mayonnaise and corn cakes). Luck went our way and the predicted late southerly change sprung up just as we launched giving us another welcome push, this time to Honeymoon Bay, our trip officially over. We knew that tomorrow would be busy as kayakers would start to arrive for the Club’s premier annual event. So, over dinner, we began to work on the logistics for our next paddling trip, somewhere on the sea. A number of us had been contemplating a trip to the Five Islands off Port Kembla (near Wollongong in the Illawarra) and, after a quick ring around, a flotilla of six kayaks made their way to the Outer Harbour on a grey Sunday morning. Our craft made an interesting group, ranging from Nick Gill’s flashing Gonad (though tragically scarred in the nether regions from the previous weekend – ’nuff said) through to Matt Turner’s well used Greenlander II. After the usual farting around with gear we lugged our boats down to the ramp, pushing off at about 8:45. The stark, industrial skyline of the steel works contrasted against the dramatic sweep of the Escarpment was captivating. After taking a few snaps we paddled beyond the tangle of huge concrete blocks of the Outer Harbour breakwater and headed south towards the three southern-most islands of the group. The moderate swell supplemented by waves reflecting off the breakwater made the paddle more interesting. We soon fell into a steady rhythm, with paddlers pairing off and enjoying the scenery slipping past. Birds ‘working’ large shoals of fish near the islands encouraged Kirin and Matt to tow lures, but with no luck. Curious at how you fight a fish from a kayak I asked Kirin what you do when you get a strike. ‘Pull it in’ was the obvious reply. It reminded me of a Mirage paddler who once told me how he hooked a 2 metre shark off Cardwell (North Queensland) and ended up capsizing after hauling it right up to his kayak. When I pointed out how he could have been entangled with dire consequences, he said he didn’t want to lose his new $15 lure! The acrid smell of guano announced our arrival at the three southernmost islands of the group. The islands are uninhabited and quite small (about 4 square km in total), and are an important marine bird sanctuary. Large colonies of petrels, shearwaters and pelicans squawking, wheeling and fighting amongst themselves were a treat to watch. The NPWS prohibits landing to prevent damage to nesting sites and the possible introduction of vermin. In any case, a landing would be tricky due to the rocky fringe and exposed location. Marine life was also abundant with forests of Sargassum and Ecklonia weed swirling in the water and large Grapsis crabs scuttling amongst the rocks. We picked our way along the northern side of the first two islands, enjoying the birds overhead and the roar of the waves pounding against the islands. After a quick circumnavigation of the easternmost island we headed back towards the mainland. Unfortunately home or work commitments ruled out any further exploration of the coast for most of us. Next time. Nick tried to catch some waves on the way back but was unsuccessful due to the confused sea. We arrived back about midday, with a procession of fishing boats still being dumped into the harbour by wheezing utes. The variety of scenery makes this a great little paddle; from industrial landscapes to spectacular nature reserves. Highly recommended. Author’s postscript: I took quite a few spectacular photos during this paddle, the most memorable being the Port Kembla Copper stack towering phallus-like from the deck of Nick Gill’s Gonad which happened to be in the foreground. Tragically this camera perished during re-entry training at the Rock ‘n’ Roll weekend – probably a blessing in disguise. About five years ago I bought a second-hand sea kayak. It was an apple-green Arctic Raider; apart from the colour, it was just the kind of sea kayak I was looking for. When I went to see the kayak, I found it in excellent condition, with the added bonus of a sail rig. I bought the lot, on the spot. The first few months that I had the kayak, I found it quite unstable. 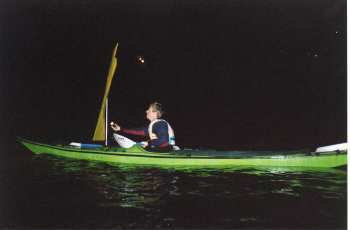 This was partly me – I had previously been paddling a very stable but high-performance skin-on-frame kayak – and partly the way the kayak was fitted out. Over a period of a few months, I gradually refined the fit-out until the Raider and I were one. During this time, I didn’t dare play with the sail. 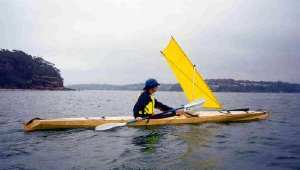 The sail was a spinnaker, a commercially-available sea kayak sail, on a telescopic mast. The Raider’s foredeck had a mast step, reinforced with a fibreglass knee-tube. On the first few attempts to use the sail on a local estuary, I found the rig very difficult to use. I was able to improve stability by jamming bottles of lead shot under the seat (up to 11 kg of shot! ), but not enough to relax and enjoy the ride. On open ocean, it was nearly impossible to even step the mast (ie: put the sail up) without capsize. I would capsize almost immediately on two out of three attempts. This is a nuisance, as you can imagine, and doesn’t make sailing a pleasant experience. I never got a good run with the spinnaker. The ability to roll is a reasonable pre-requisite for kayak sailing. It helps to have a certain level of comfort under water too, as it is often necessary to pull the sail down and dismast, preferably also to bundle up the sail and stow it, before rolling up again. 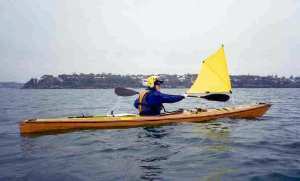 A spinnaker may well be a good downwind sail on a purpose-built sailing boat, but it’s not much good on a sea kayak. A spinnaker is a loose-footed sail, therefore tends to flog around in any sort of wind, decreasing stability. At the same time, it needs both hands for control, so you can’t paddle or brace. For a short while I experimented with parafoil kites. Many people are enthusiastic about kites as sails. All three parafoils that I tried took a lot of mucking about to get them flying and when wet they were next to useless. I wasn’t encouraged to continue trying. About a year later, I had the opportunity to try a Tasmanian pattern sprit sail – very popular down south, but not as common in NSW. Unfortunately, it was blowing a gale and I had no idea how to use it – oops, wet again! Despite this, it looked like a good idea, so I made one – a friend had some aluminium tubing for the mast and boom, the local archery shop had a suitable arrow shaft for the sprit and the local sail maker sold me some 30 gsm polyester sail cloth. This turned out to be a good sail. I have several good memories of long runs downwind or on various reaches, outrunning my paddling companions without a single paddle stroke (as long as you don’t count lots of bracing and turning strokes). The rudder that came with the Raider was a boon. the sail is quite high above the deck, increasing the tendency to capsize in a gust of wind. Throughout this time, Norm Sanders and others were developing various features of the folding sprit sail (see The Old Sea Dog’s Gear Locker in Issue 36 of NSW Sea Kayaker). Bruce Wingrove used a separate folding step with his rig and Mark Pearson and Mik Snoad used different sail shapes and sizes. the sail can be close to the deck, minimising the tendency for a gust to capsize the kayak. A further advantage, not so clear at first glance, is that the sail can be positioned well forward, so that when under way the kayak, paddler and sail are more-or-less neutral in the wind, and the kayak will go where you want, without a desperate need for a rudder. 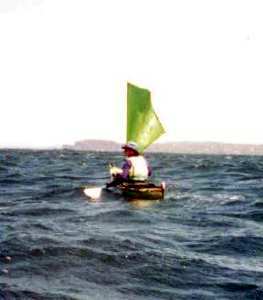 The Tassie pattern sail needs a rudder – the sail has to be in reach of the paddler, so it is almost always too far back on the kayak (it has a strong ‘weather helm’). Without a rudder the kayak will always tend to turn up into the wind. This effect is even more exaggerated in those Tassie rigs with a second mast and sail behind the cockpit. In contrast, the Norms’l works on a rudderless kayak! So, I reasoned, there may be a way to have some, or all, of these advantages without butchering my Raider to remove its fixed mast step. I scoured sailing books and other resources, looking for a sail pattern which might give me a better rig. the 2,500 year old Mediterranean sail pattern called a lateen, which is still in use in some types of dinghy and in the traditional Arab dhow – with this sail pattern (and a little tinkering) it was possible to equal the Norms’l’s stability and have the mast in reach and have the sail out of the way of normal paddling strokes, all at once! instead of raising the sail by sliding it up the mast on a parrel – the traditional way – the mast, sail and various spars have to be permanently attached to each other; this makes a different sort of assembly necessary. The mathematical model says that a 0.75 square metre cutaway lateen would have about the same capsize potential as a Norms’l of the same size and about half the capsize potential of a Tassie rig of the same size. Good! it fills the field of view and is hard to see past. it keeps its shape in all winds (where a Tassie rig or a Norms’l will tend to billow out and lose even more efficiency as the wind freshens. All in all, it looked as if it would be the perfect sail for my new Baidarka. Well, after a few good sailing days, including a wild downwind run sailing and towing on the Rock ‘n’ Roll weekend, I’m certain of it. The Baidarka is very strongly swede-form and the sail sits so far back on the kayak that the Baidarka shows a strong weather helm and more steering strokes are necessary than expected. This is manageable. Naturally, the sail and kayak look good together, too. the cutaway lateen, for its high aspect ratio, low capsize potential and cool looks. Anyone is welcome to measure and copy this sail rig. Just get in touch. The Club executive held special meetings on Tuesday, December 5 and Sunday, December 17 in response to the events surrounding the flare exercise conducted on Sunday, November 26 at the 2000 Rock ‘n’ Roll and AGM weekend. As a result of these meetings, the following changes to the NSW Sea Kayak Club’s operational procedures and policies have been implemented, and have been done so for the improvement of member facilities. These changes are necessary to ensure that we make the fewest possible errors when we go out to play on the ocean. We hope these changes will also define a clearer path from the dream of paddling on the ocean through to the reality of actually being out there. 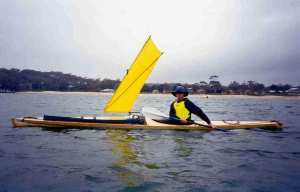 The NSW Sea Kayak Club is an incorporated body, for reasons which fit us into the current legal system and, we hope, protect members from some of the worst risks that terrestrial life (as distinct from the sea) can throw at us. Despite this incorporation, the Club is not a profit-driven organisation. We are a voluntary, non-profit organisation. We produce a good Club magazine and website which takes considerable leisure time from just two people. We provide valuable services to kayakers including forums for meeting with other kayakers and participating in organised paddles, training facilities and representation through official channels and to official bodies. This all takes up substantial time from a small group of dedicated volunteer paddlers. We all contribute what skills we have, for the benefit of other like-minded people. Positive assistance in running the Club is always welcome, and ALWAYS needed. Since the Rock ‘n’ Roll weekend several well-qualified people have stepped forward to offer their expertise in disparate areas of management of our organisation. We will build on the draft standard operating procedures that were presented at the AGM and use the offered expertise to ensure that the procedures become a rock-solid core to the Club’s operations. The following steps are the start of a complete re-vamp of the Club’s activities. We intend to bring the Club into the 21st century in a form which can grow from the strengths the new Club executive committee has inherited. To date the Rock ‘n’ Roll weekend has been a great success in introducing people to our Club. It started out as a social event, to meet other paddlers, and an opportunity to teach rolling. It has grown to the extent that we no longer have the resources to manage it safely and effectively. There were in excess of 70 kayaks on the water on the Saturday morning of the Rock ‘n’ Roll weekend, with only a handful of Board of Canoe Education (BCE) qualified Instructors and a few trainee Instructors. This does not meet the Board of Canoe Education’s standards for Instructor to student ratios. Step 1 – The Club is unable to run the Rock ‘n’ Roll weekend in its current form, with existing Club resources. During 2001 the executive will determine whether the Club is able to run large group events at all, and if so, will establish procedures that will allow the Club to effectively manage and control such events. For some time, the Club has had a policy under which all participants in events organised by the Club must sign a waiver. This waiver acknowledges that the participant is a member of the Club, understands the risks associated with sea kayaking, will comply with Club rules and policies while participating in the event and agrees to limit the legal liabilities of the Club, its officers, members and agents. This waiver is available from Trip Leaders, from the Club magazine and from the Club website. There were over 100 kayaks present at the Rock ‘n’ Roll weekend and a similar number of people. There were over 70 people on the water at the start of the Saturday morning classes. The Club collected only 54 waivers. There was no way to know exactly how many members were present, or who they were. This places an unacceptable burden on the organisers of events and on the officers of the Club. Step 2 – ALL participants in ALL Club events will fill in ALL sections of the Club’s waiver form, before participating in the event. Anyone who does not do so is excluded from the event. This will be enforced by, and for, ALL members. We have run regular, successful rolling sessions, Sea Proficiency weekend classes, surfing weekends and a Trip Leaders’ training course. Procedures are already in place to ensure the success of these classes and courses, and these procedures have proved both effective and workable. The class sizes are manageable and within BCE guidelines, so we will continue to run as many of these courses as is practical. There are several in this issue of the magazine and trips calendar. We expect to qualify several Sea Instructors during 2001. These people will be invaluable for future training courses. The Club is committed to raising members to a skill level where they can paddle on the open sea. Step 3 – The Club’s training program will concentrate on quality, purpose-designed skills courses, conducted according to BCE requirements for Sea Proficiency training. The NSWSKC’s Sea Proficiency training opportunities are run by volunteer members and are provided free for the benefit of other members, except where fees are due to third parties (EG: camping fees, expert coaching, etc). Club officers, trip leaders and instructors receive no pecuniary reward or reimbursement of costs for their involvement in Club events. Please make use of these training opportunities. They are your key to safe and enjoyable ocean paddling. In addition to the Club’s training opportunities, there is a range of commercial training providers to complement the Club’s courses. The Trip Leaders Briefing Guide (the Guide) is a new operational document introduced to the Club at the 2000 AGM. In limited testing it has proven itself effective in assisting in the management of small groups on sea kayaking trips. Laminated copies are available to Trip Leaders from the Trips Convener on request. The Guide is also available as a PDF file from the Club’s website and is published in this issue of the Club magazine. The Guide must be used by Trip Leaders and trip participants must adhere to the provisions of the Guide. It is in everyone’s interests to read it, absorb it and use it. Step 4 – Effective use of the Trip Leaders Briefing Guide is a mandatory part of every NSWSKC trip. The flare exercise at the Rock ‘n’ Roll weekend highlighted the difficulty of managing large groups on the water. As a result of this, NSWSKC trips will have limited numbers of participants. The BCE already sets maximum student to Instructor ratios for classes. Where it is reasonable to have more than 12 participants at a Club event, such as training events that are restricted to on-shore or very near shore activities, the BCE student to instructor ratios will be adhered to. Attendance of members in such cases is therefore limited by the participation of Instructors and qualified Trip Leaders. Event Coordinators and Trip Leaders will set and enforce attendance limits in accordance with these guidelines, IE: if only two instructors/leaders are attending, participant numbers are limited to 12 no matter the nature of the event. Events, other than explicit training classes, will now be limited to 12 participants maximum, when two leader-qualified paddlers are present, otherwise limited to six participants, or some lesser number set by the Trip Leader. Step 5 – There will be a maximum group size of 14 (two Trip Leaders and 12 participants) for any Club trip, other than training events. Step 6 – There will be a maximum paddler to Trip Leader or Instructor ratio of 6:1 on any Club event, including training events. We held an inaugural Trip Leaders’ Training Course last September. It was a great success, proving several issues are important for leading successful sea kayaking trips. We have scheduled another course for the calendar on the weekend of 31 March to 01 April 2001. This is for paddlers who already have Sea Proficiency and wish to lead sea kayaking trips. Step 7 – Starting with the second calendar in 2001, it will be mandatory for NSWSKC Trip Leaders to have the BCE Sea Proficiency certificate and to have passed the NSWSKC Trip Leaders’ Training Course. The Grading System has been evolving for several years. It started out as a means of grading trips to give potential participants an idea of the relative difficulty expected on a trip. Some aspects of the Grading System have been very successful while other aspects have seen a lot of changes. With due consideration of the overall skill levels of Club members, the grading system was extensively revised in September 1999. The Club has always had a strong ethos of self-sufficiency. This is mandatory on the ocean – it is bigger than we are and ultimately we are alone out there, even when we are only five metres from our companions. In light of the difficulty that members had in assessing themselves on the Rock ‘n’ Roll weekend, we have changed the previous Trip Grading System to a Paddler Grading System, simplified several areas (including the weather and sea criteria for each grade), clarified several areas where there were potential ambiguities, and changed the minimum trip preparations to be more consistent with the experiences of many paddlers at the flare exercise. All members now have a grading, depending on skills and fitness on the day, and on formal skills and seamanship qualifications. All events in the calendar have a recommendation for the minimum skill and fitness level (the minimum Paddler Grading) for the event. Step 8 – A new Paddler Grading System comes into effect immediately. All members must be familiar with the Paddler Grading System. The Paddler Grading System is published in each issue of the Club magazine. Step 9 – A further change, to incorporate the Trip Leaders’ training course requirements for Trip Leaders will come into effect with the second calendar in 2001. The Board of Canoe Education (BCE) runs a database of canoeing and kayaking incidents. A full composite description of the flare exercise at the Rock ‘n’ Roll weekend will be sent to the BCE for incorporation into their database. This information and the following discussion by interested parties, Australia-wide, will contribute to sea kayaking safety in the future. Step 10 – Any sea kayaking incident in the future involving the Club or Club members will be added to the BCE database to assist in the improvement of kayaking for all kayakers. We urge all members to make use of the trips that the Club organises and the training opportunities that are provided as part of your member benefits. In turn, recognise your obligation to self-assess and when you can, train as a Trip Leader or Instructor and put back some of the things you have gained from the Club. Sea kayaking can only be made a richer experience, for all of us, as a result. Sunday: 6:00-8:30 am. Grade 2. Early morning paddle and flare exercise… At 7:30 am we will be doing a flare exercise north of Beecroft Head… After the flare exercise we’ll adjourn to Abrahams Bosom Beach for breakfast… Meet on the beach at 6 am. At around 6:15 am a large group of paddlers congregated at Currarong. Trip Leader Dave Winkworth called back a part of the group that was already on the water and conducted a trip briefing and head count. This large group put to sea but stragglers were leaving without the acknowledgement of the group leader for another thirty minutes. A total of 49 paddlers were counted once on the water. The combined ebb tide and south-easterly setting ocean current were constricted between the cliffline of the Beecroft Peninsula and the ‘Sir John Young Banks’ leading to a localised current of up to 4 knots. As a result of worsening conditions the group split into three. Many stronger paddlers left during or immediately after the flare exercise and these paddled in smaller groups, or alone, apparently oblivious to the difficulty experienced by those left behind. Of the paddlers who took part in the flare exercise, over half returned without incident. Those that were unable to make headway in worsening conditions were assisted and accompanied by the four most senior paddlers (one Senior Sea Instructor, two Sea Instructors and one trainee). Andrew Eddy took a group of five with the wind and current to Gumgetters Inlet. They later walked out and collected their boats the next day. The three remaining senior paddlers worked hard against deteriorating conditions towing tired paddlers. They were assisted by several experienced paddlers including John Wilde and Larry Gray who paddled out from Currarong to help and later did a sweep down the coast. The most inexperienced and least fit were exposed to the roughest conditions as the forces of wind and current strengthened and conflicted. Of the remaining group approximately half stopped at Lobster Beach and did not require any further help. However, a total of ten paddlers required assisted rescues (most of these around Little Beecroft Head). Two of these were eventually put ashore by a small power boat. It is believed that the power boat had responded to our call to the Shoalhaven Heads Rescue Service. The police had also been notified of the incident and a shark spotter plane, which was already in the area, did a sweep along the full length of the Beecroft Peninsula. By noon all paddlers and rescuers were off the water. Because not all paddlers had signed waivers and many simply arrived late and followed behind the group, a head count and numerous cross checks had to be carried out. These were coordinated from the meeting room and occupied ten Club members until the early evening. At around 7 pm the police were notified that all listed paddlers and campers were accounted for.